Though north central Colorado is seeing some snow Sunday, the plains can expect colder temperatures and minimal precipitation. In contrast with western Colorado, the plains will see cooler temperatures Sunday as highs hover around the freezing mark. Las Animas county will be an exception as Trinidad reaches highs in the mid-50s, while Kim reaches the upper 40s. Most of the area will be dry, though the plains could see a few sprinkles that offer little hope of relief for drought conditions plaguing much of the state. A brief warm up is expected Monday as highs jump to the 60s for the southeast, and 40s to 50s for the northeastern quadrant. Some areas could see higher fire danger return for the day before a chance of rain later in the day turns to snow overnight. Temperatures drop off again for Tuesday, with the Trinidad area maintaining its status as a warm spot for the eastern half of the state. A temperature rebound is expected for the middle of the week. Northern mountains received some snow overnight, with 2-4 inches possible throughout Sunday. Monday, temperatures are expected to cool slightly from the past few days, though highs will still remain as much as 10 degrees above normal. The southwest portion of the state can expect highs in the mid-50s, with low 40s further north. By mid-week, high temperatures will drop off to the 40s in most areas, with mid-30s to the north. Monday night into Tuesday, look for some snow - only 1-2 inches - in the southern mountains, while the central and northern ranges could see as much as six inches. Drier conditions prevail during the middle portion of the week, followed by the potential for more significant snow heading into the weekend. 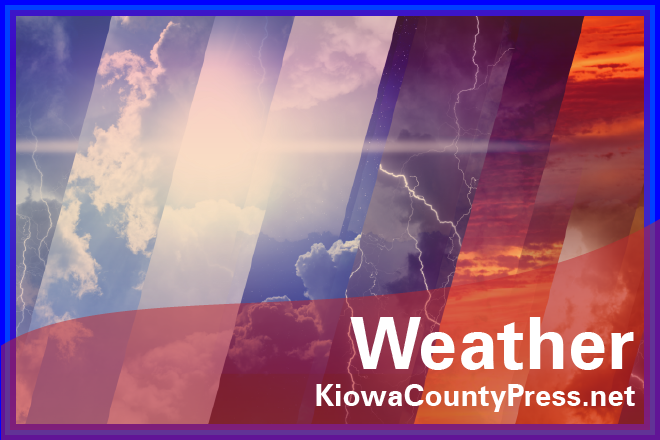 Weather information updated throughout the day is available at http://KiowaCountyPress.net/weather.